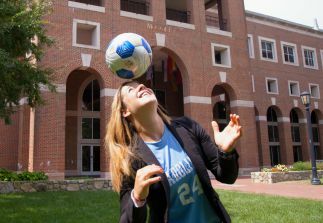 UNC women’s soccer captain Paige Nielsen will be fulfilling a lifelong dream when she graduates from Carolina on Sunday. In her four years at Carolina she totaled 13 goals and 7 assists and this year she was named a Senior All-American. But Nielsen’s impact extended far beyond the soccer pitch. As an Eve Carson Scholar she frequently got involved with community service. But after her mother was diagnosed with lymphoma, Nielsen began to dedicate herself to that cause. Nielsen said she wants to organize a college scholarship for children in single parent households whose parents were diagnosed with cancer. As far as what’s next after graduation, Nielsen is keeping her options open. But if you’re looking for Nielsen at the graduation ceremony on Sunday, don’t bother, because she’ll be in Charlotte, watching the Panthers play the other kind of football.